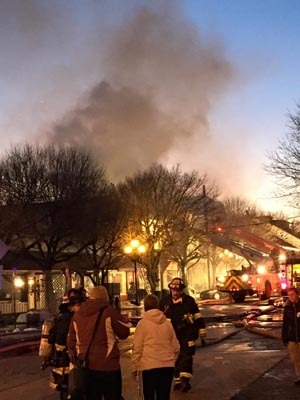 The Fri., Feb. 6 fire on Main Avenue in Ocean Grove. Photo by Richard Virgilio. Born and raised in Ocean Grove, Bobby Eastin knows the charm of the late 1800s historic community. And Eastin, 40, knows the dark history of fire in a town of old wooden structures only inches apart from each other, sometime whipped by a Shore breeze. But Eastin said he was not thinking of that on the afternoon of Friday, Feb. 6, when he walked out of the business he owns, Ocean Grove Hardware at 51 Main Ave., and saw smoke pouring out a building across the street that his hardware store helps maintain. He, as others did, called 9-1-1, then entered the burning building – with four stores at ground level and seven apartments on the second and third floors – at 50 Main Ave. to evacuate it. He passed two people fleeing on the stairs. Then, knowing the building and its tenants, Eastin figured the third floor should be empty, so “I started knocking on doors on the second floor.” He helped another two people out of each’s apartment on the second floor. “Everybody I could account for, (then) I went back downstairs,” Eastin said. Outside, Eastin ran into Teresa Lepore, owner of Gingerbreads Teas and Treasures at 49 Main Ave. They entered Smuggler’s Cove, located in the burning building and owned by Lepore’s husband, Richard, saving what they could. During the fire at 50 Main Ave., the roof of the three-story, wooden building collapsed, causing Neptune Township officials to order the 8,420-square-foot demolished. Gone were four stores – Fusion Jewelry, Village Kloset clothing, Smuggler’s Cove gift shop and Yvonne’s Cafe – along with the seven apartments. Also, smoke, water or heat damage has left the Barbaric Bean coffee shop and two apartments at 48 Main Avenue and a few apartments at 56 Main Avenue temporarily uninhabitable, said J.P. Gradone, chief operating officer of the Ocean Grove Camp Meeting Association. Now, Ocean Grove is re-grouping, with various charitable efforts underway, including the “50 Main Avenue Fire Relief Account,” to be used for the approximately seven apartment residents at 50 Main. Another fund-raising effort for 50 Main Avenue apartment residents is the “Ocean Grove Fire Victims Donations” on the gofundme.com website. Various goods also have been donated for victims. Gradone, Arnold Teixeira of the Starving Artist restaurant and Mary Ellen Tellefsen of the Sea Spray Inn opened the 50 Main Avenue Fire Relief Account at Central Jersey Bank on Monday, Feb. 9, and, by the following day, were sending out $7,752 to victims, Gradone said. Those behind the 50 Main Avenue Fire Relief Account have stopped taking clothing and other goods, with any extra items being donated to charity, Gradone said. He said monetary donations, which are tax-deductible, are now needed. The fire was reported about 3:30 p.m. Friday, with investigators narrowing its point of ignition to a second floor apartment where no one was home at the time, according to the Monmouth County Fire Marshal’s office. An estimated 200 firefighters from 10 to 12 fire companies fought the blaze, said Deputy County Fire Marshal Dean Stoppiello. He said they were on the scene until Saturday morning. The human toll was four minor injuries to firefighters, Stoppiello said. Eastin said at least four pets — one dog, at least one cat, a turtle and snake – died in the fire. Investigators were not able to enter the building because of the roof collapse, Stryker said. Then, complicating matters was the building being demolished, Stryker said. “They’ll never know (the cause), because they had to tear down the building,” said Neptune First Aid Squad Second Lt. Bob Ware, one of the first-responders at the scene. Ware knew by the address he was responding to that the fire was in the area of his brother-in-law’s, Leonard Steen’s, restaurant, Nagle’s, and the Fusion Jewelry store owned by his friends Janet Mazur Cavano and Kurt Cavano. When he got to the scene, Ware saw that the store owned by Janet Mazur Cavano, whom Ware has been friends with for 35 years, going back to when both were reporters at the Asbury Park Press, was part of the fire. “Her first and foremost concern was the tenants,” Ware said. Ware later learned, when told by a reporter, the Cavanos actually owned 50 Main Avenue – valued at $1.2 million, according to Neptune Township tax records. Janet Mazur Cavano said she and her husband have owned the property for 19 years. The family, Ocean Grove residents for 31 years, plans to rebuild in some way and re-open Fusion Jewelry, but exact plans are to be determined, Janet Mazur Cavano said. When the fire was reported, Mechura was in her second-floor apartment and escaped with her two dogs. She is now staying rent-free at a Stockton Avenue house, normally used as a summer rental, owned by a friend. Next-door at 48 Main Avenue, also owned by the Cavanos, Barbaric Bean Coffee House suffered “a lot of smoke damage, water damage” and expects to be closed for six to eight weeks, said Jenni Lewis, who owns the business with her husband, Jeff. “It’s a significant impact,” Jenni Lewis said. The Lewises bought the business only seven months ago. Now, they are trying to find temporary work for their five employees, Jenni Lewis said. “We really value them,” Jenni Lewis said. The 50 Main Avenue Fire Relief Account can be reached c/o Central Jersey Bank, 61 Main Avenue, Ocean Grove, 07756 or via this Go Fund Me page. Posted in Shore Communities and tagged Joe Sapia, Ocean Grove.